The kriyatmak form of god adherence the world. This power is Shri Krishna. It is no existence and adherence of earth without Shri Krishna. Planets, constellation, goddess, god, human, devil, auspicious-inauspicious everything are under Shri Krishna. Therefore, Shani is also under the power of Shri Krishna. If there is no Shri Krishna then there is no Shani. Lord Shani is devotee of Shri Krishna. He gets justice, honesty and disciplined due to mercy of Shri Krishna. Shani gets curse from his wife as he was in the meditation of Shri Krishna. Shani has similar properties as Shri Krishna except sweetness. Those who are devotee of Shri Krishna, lord Shani cannot harm them. Keep Shri Krishna as idol form. Offer yellow flowers and basil leave in morning-evening. Do sandalwood tilak to lord Krishna and yourself. Then, up your both hands and do kirtan. You can also chant “Krishna-Krishna”. Eat pious food. 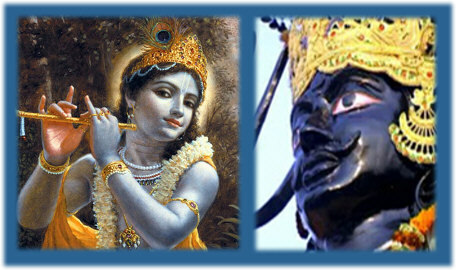 Sade Sati-Dhayya: Keep Shri Krishna image or idol. Daily offer sandalwood, flower and basil leaf. Chant Krishna psalm “Om Krishnaya Vasudevaya Haraye Paramatmane Pranatah Klesha Naashaaya Govindaaya Namo Namah” for 108 times in morning-evening. Employment, Health and Age: Keep Shri Krishna image, in which he is with the cow. Daily morning offer panchamrut mixing basil leaf. Chant “Shri Krishnam Sharnam Mam”. Eat panchamrut as dainty. Do this remedy for 27 days. Good Luck: It is auspicious to wear blue or purple color clothes on Saturday. Do not wear black color clothes on Saturday.